Beets are often added to salads and soups, and for good reason. Just one cup of raw beet offers 2.2 g protein, 3.8 g of fiber, folate, vitamin C and potassium, all for the tiny caloric price tag of 58 calories. Beets are easy to add to recipes when they've been steamed for maximum flavor and softness. By steaming a batch of beets, you can keep them handy in the refrigerator to eat on salads or on their own. Wash the beets in warm water, scrubbing gently to remove the chalky outer skin and any visible dirt. Fill a medium-sized pot with 1 to 2 inches of water and place on your stove on medium to high heat. 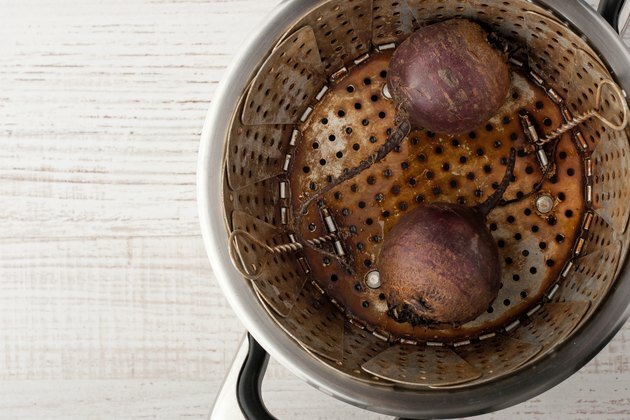 Place the beets into a steam basket and the steamer basket into the pot. Cover and bring the water to a boil. Reduce the heat to medium and allow the beats to steam until they are easily pierced with a knife, which should take about 15 to 30 minutes, depending on the size of the beets. Avoid removing the cover, which will allow steam to escape and prolong the cooking time. Add beets to recipes or store in the refrigerator in an airtight container.